I had last seen it over three decades ago, as a little girl who was on a train from Bombay to Jammu. There are some images that are burned into my memory, and then there are others that seem more like hazy dreams in black and white. Strange. The two-lane National Highway that led to Agra from Delhi was an exercise in deep breathing and stress management. The right lane was for faster traffic but invariably, there was a slow truck in that lane, making it necessary for us to swing out into slower traffic to make an attempt to get past! The slower lane usually disintegrated into several lanes, with auto-rickshaws, scooters, farm-tractors pulling a wagonful of people, pick-up trucks and other smaller indigenous vehicles. The shoulder was for even slower traffic: bicyclists, mopeds, animal-drawn carriages and large vehicles coming from the opposite direction. We seemed to be the only people troubled by the apparent lack of traffic discipline. 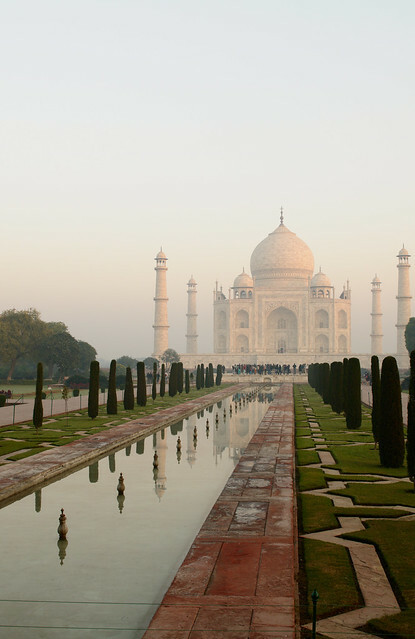 We first saw the Taj at dusk and that made me even more determined to see it at sunrise. 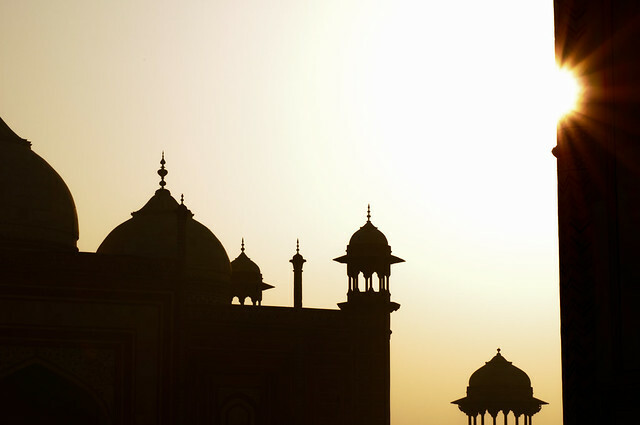 It was also the only sunrise I would get at the Taj, even though we were staying one more night. The monument was going to be closed from early afternoon the next day until the following morning for the private viewing of the Russian President. Absolutely absurd. Yes, I was very upset. 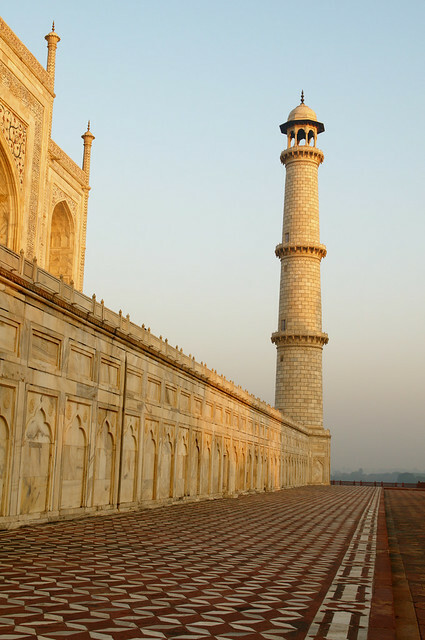 If the Taj shimmers by moonlight, it glows in the golden light of the morning. It reflects the changing colors of the sky as it welcomes the rising sun, from pink to orange hues. Once the sun has risen, the monument loses color and shows off its glistening white marble. You can see that in the standard full frontal snapshot that every tourist must take. If they do not, the camera is whisked from their hands by an over-zealous guide who then shows them how it is done. And so, we have one, too. I had only one pre-condition for our guide: do not rush me. I am not your regular tourist who wishes to speed through the monument, not remember anything yet claim to have been there. I like to stand, stare, lie on the floor, look up at the ceiling, sit, wonder what it would have been like to live in that bygone era. Rush me and it's goodbye. Our guide spent a lot of time talking on his cellphone, which incidentally are not allowed to be used inside the monument. Medha was rather irked by the overall lack of respect for rules. I made the most of my time at the Taj Mahal, knowing that I would only get to see it again from across the river. I wanted to go for a boatride in the river but alas, there was very little water and no boats. 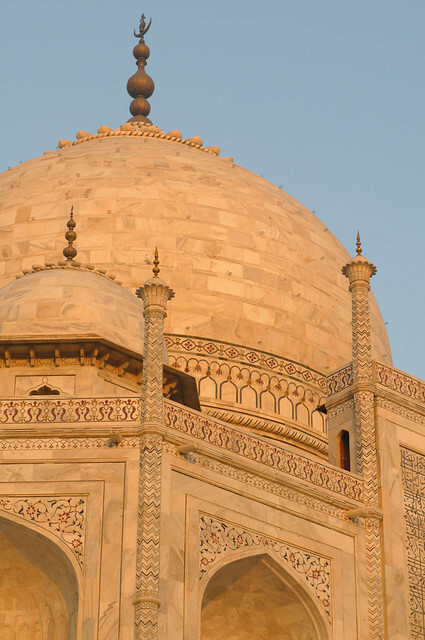 Despite this and the Russian President's meddling, I fully enjoyed my time at the Taj and left for a sumptuous breakfast at our hotel, as the throngs of people started arriving for their moment in the sun with the marble wonder. 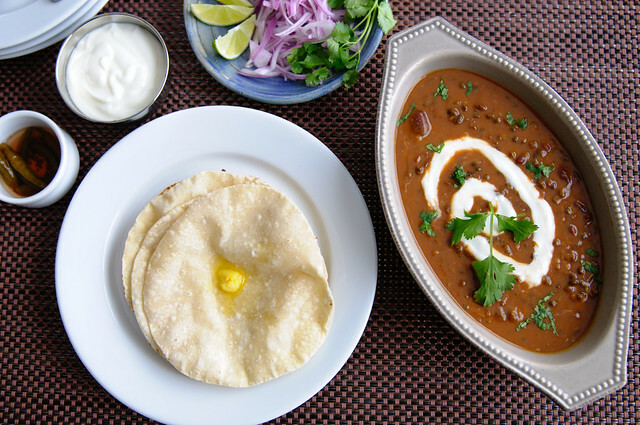 For some crazy reason, I associate Agra with maa di dal — better known as dal makhani in Indian restaurants — even though this is a dish that has its roots in the langars of Sikh gurudwaras, not the kitchens of the Mughal Empire. Maybe it has something to do with those sepia memories, I can't be sure. The hotel we stayed at on this visit had a restaurant known for its dal bukhara, a dal similar to maa di dal but one that simmers all night long and is made from whole urad dal or unhulled ivory lentils with no dark red kidney beans. 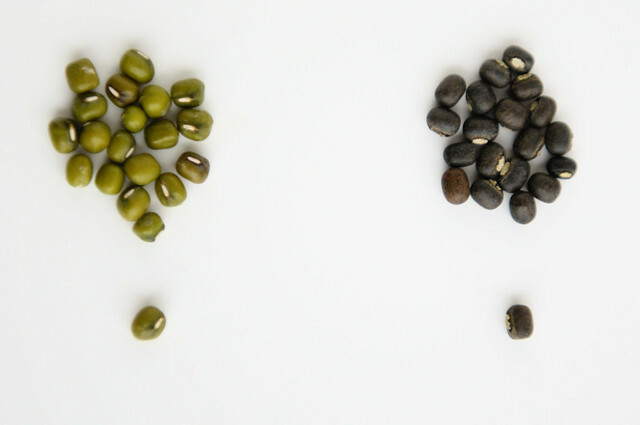 Whole urad dal is a little smaller and less plump than mung beans. It is much darker, too; almost black in color. My dal makhani is a lazy person's healthy adaptation of Madhur Jaffrey's recipe for maa di dal from her popular cookbook, Flavors of India. Clean the black urad dal of any debris, wash and soak overnight. If you are short on time, do a hot soak instead. Drain the water. In a pressure cooker, add the soaked black urad dal and 3 cups of water. Cook under pressure until the beans are soft and give way easily when pressed between your finger tips. (This translates into 3 whistles or pressure releases for my pressure cookers.) The dal will appear to be a dark shade of brown on cooking. Transfer half of this cooked dal to a large pot or kadhai and lightly mash the remaining dal into a coarse purée with a potato masher. Remember that half of the cooked dal must remain whole! Rinse and drain the canned red kidney beans. Transfer half to the kadhai with the cooked whole urad dal and mash the rest, like you did with the whole urad dal. Transfer the puréed dal and red kidney beans to the kadhai and add ginger, garlic, tomato paste, red chilli powder, unsalted butter, garam masala and salt. Add 2 cups of water or more to bring the dal to a consistency you like. Simmer gently for about half an hour or so, stirring occasionally. Just before serving, add heavy cream (if using) and stir. Cook for another 5 minutes, garnish with chopped cilantro and serve hot with rotis. 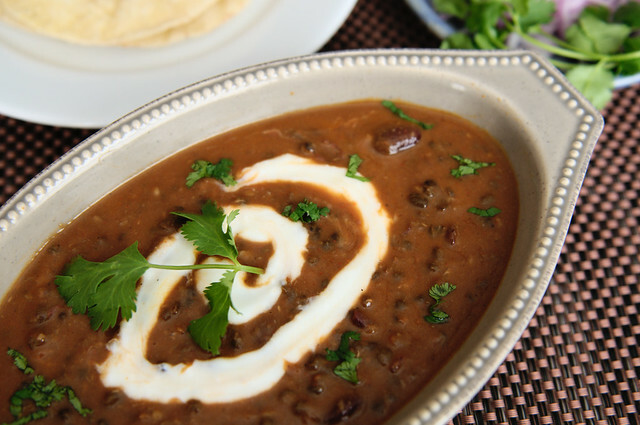 You could do everything from scratch and soak 1/3 cup dark red kidney beans along with the whole black urad dal. Increase the water by about 1 to 1.5 cups when you cook the beans with the urad dal in the pressure cooker. If you don't have a pressure cooker — and I have to ask you why ever not! — your beans could take anywhere from 3-5 hours to cook. Love your environment, save fuel, increase your efficiency, invest in a pressure cooker! I usually have cans of dark red kidney beans on hand, therefore I prefer to use those. 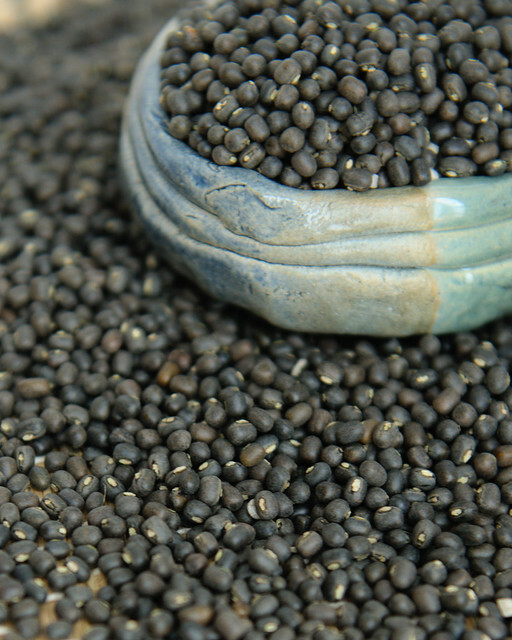 Whole black urad dal can be found at any Indian grocery store. I have made this with whole hulled urad dal and it was just fine. A little anemic in appearance but there was no loss of flavor. Or else substitute with any small bean that turns creamy when cooked. There are times when I don't add garam masala. The flavors are similar to that of chicken makhani, which has very little garam masala. We are not fans of Punjabi garam masala so I use very little of it or substitute with my regular garam masala. I usually skip the heavy cream and add some whisked yogurt on top before garnishing with chopped cilantro. My yogurt art is up there for you to enjoy! Traditionally this is served with a generous dollop of unsalted butter or red onions fried in ghee. If I worked in the fields or did heavy manual labor on a daily basis, I might have considered that but given the sedentary lifestyle we lead, I pass on adding more butter. Those black and white memories? Those were photographs that my father took in 1976; my sister has a boxful of them. Since we both recipes are inspired by the great Madhur Jaffrey we needn't even fight about who will have the last word (which might remind you that your word is pending on that post). Those be pretty phulkas with loads of ghee. Those are what you ate at the restaurant, right? If they are what you made, then I have to bow to you (shataang pranam, no less). The 'maa' comes from 'mah' where the h may be silent in heavy Punjabi accent which itself is short for 'Rajmah'! Had mah di dal on monday.... your yogurt swish looks lovely. Eerie you two posting Mah di dal at the same time! Why do you give me goose bumps all the time :) Loved the pics Manisha. The phulkas/ rotis look fantastic. While I love maa-ki-daal, I haven't been satisfied with my version even though my recipe is inspired by MJ. No haat ka jadoo, I guess. Beautiful Photos. 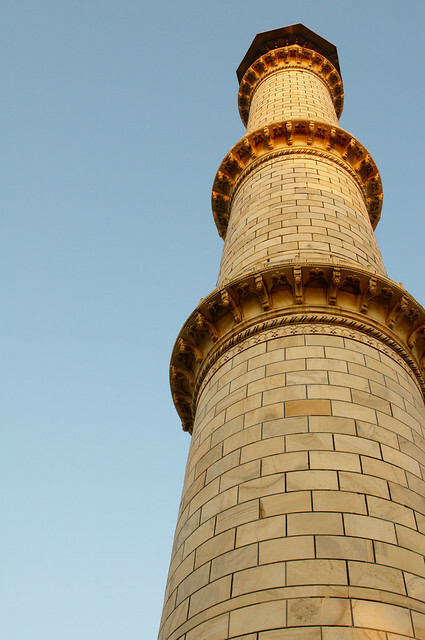 The Phulkas look as good as the Taj. Hard to choose. Oh how I wish I'd read this yesterday. I made a dal disaster last night and it had to go in the trash. It was my first attempt and I had doubts about the recipes I found so tomorrow I'll be back at the store buying the ingredients so I can follow your recipe. It looks delicious and I know your recipes work. Love your perspective on the Taj. My first time was 38 years ago and I had to laugh at your comment about the guides snatching the camera away. I thought my dad was going to burst when that happened to him. When I took a trip back to Agra on a little weekend getaway while I was living in Bangalore I must have either had a very -- "don't even think of it," look or was so mellow and laid back that I had that, "oh, ok, if that's what you want to do, but really, it's not worth your time" look. Either way, my guide was great and no camera snatching and he didn't follow me all over the place. I got to take pictures as I wished and linger wherever I wanted. Totally relaxing and enjoyable. I haven't been to the Taj Mahal in YEARS! Your post is making me yearn to visit again and I absolutely understand about not speeding through. I want to see everything leisurely! Why do you doubt that I made those phulkis? I would have made some for you if you had asked me to. 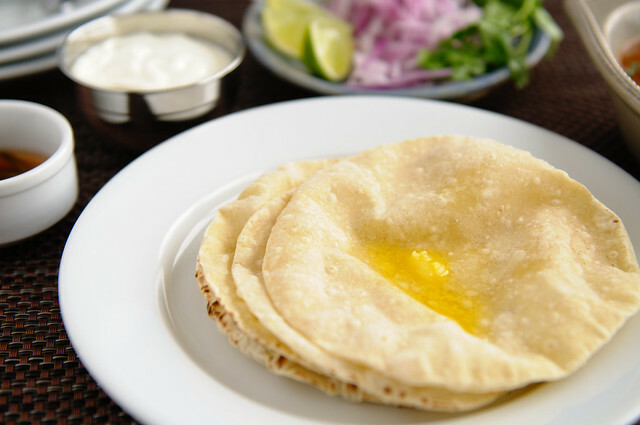 I'm sure you've seen this puffed up roti as well as my paratha posts before! Hmmph! GB, nothing wrong with Punjabi garam masala! We just prefer it in smaller doses! Anjali, totally weird, especially considering we don't belong to one of those post-same-recipe-together groups. And lately, it's a good thing if she manages to post so I am not complaining! Torviewtoronto, thanks! Let me know if you try it! TC, faux malai is best! Aur kya? Which MJ recipe did you use? Mine or Anita's? Bong Mom why choose?! Make the dal and look at the pics! Best of both worlds! Frantasticfood, I do my best to translate the recipes yet maintain the flavors with the ingredients we have available here. Your poor Dad! I can imagine what he went through but so glad your visit was pleasant! Alpa, you should go again soon! I want to go back to see sunset and sunrise from across the river.